IEEE GEM 2018 will be staged in the Alice Perry Engineering Building at National University of Ireland Galway, August 15th-17th. IEEE GEM was originally established in 2009 as the IEEE “International Games Innovation Conference”, held originally in London and since then at various venues in US & Canada. The conference name transformed into its GEM title in 2012 to encompass interactive entertainment & digital media technologies. 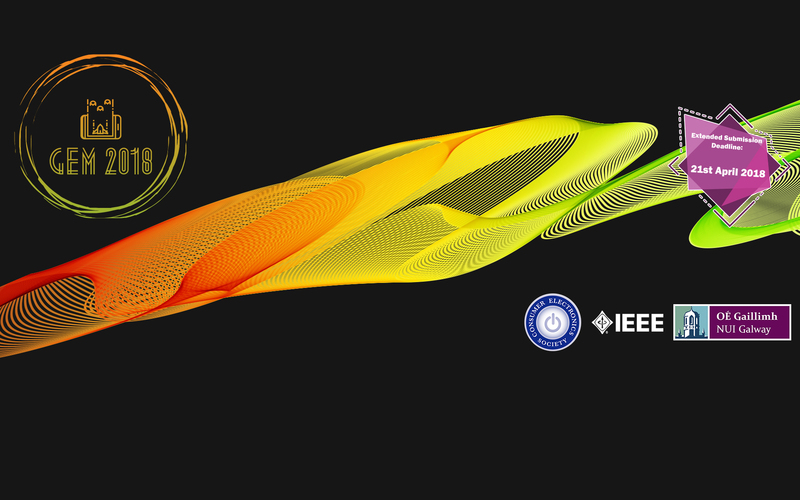 The conference was originally established and sponsored by the IEEE Consumer Electronics Society in 2009, envisaged as a platform for disseminating academic peer-reviewed papers and industry innovation papers that describe innovative research and development and implementation of digital games technologies. The conference has a tradition of strong engagement from industry in addition to its academic delegates. In the 2018 program there is a strong focus on Virtual & Augmented Reality technology and new immersive consumer experiences; there is an active track on the use of VR & AR in teaching & education; also an active theme on the use of Gaming Technology to support medical & healthcare. The 2018 conference also adds a conference track with a focus on the digital Arts & Humanities. We also have two pioneers of Virtual Worlds technology in Richard Bartle and Jackie Morie who will present plenary sessions. In addition we have panel sessions on The Art of Immersion, Games & Data for Health, Immersive Education: Augmenting the Learning Experience; and, of course, a Game Developers panel. There are also ‘hands-on’ technical workshops on IoT & Cybersecurity, Deep Learning & Edge-AI and, A Game Developers workshop. Apart from our panels, workshops and a program of 20+ oral & poster sessions on the latest research in games & interactive entertainment technologies the conference will feature a social program. After the conference, delegates can have an opportunity at the week-end to explore the rich heritage & history of the West of Ireland via the Wild Atlantic Way. Galway is conveniently situated at the mid-point of this 1,500 mile long coastal adventure. And, of course, Galway town is an attraction unto itself. IEEE GEM 2018 features a strong line-up of International Speakers including Richard Bartle who “wrote the book” on “Designing Virtual Worlds” – the manual for MMORPG designers; Kate Edwards, CEO of Geogrify & former Executive Director of the International Game Developers Association (IGDA), Mia Consalvo is the Canada Research Chair In Game Studies & Design at the University of Concordia in Montreal, Kay Meseberg is the Head of Mission Innovation at the European cultural network ARTE, Jacquelyn Ford Morie is an artist, scientist and educator working in the areas of immersive worlds, games and social networks and Aljosa Smolic, formerly with Disney Research and now SFI Professor of Creative Technologies at Trinity College Dublin. There are guides on accommodation & travel on the conference website. Registration is via the main conference website; it will be active from next week and the cut-off for early-bird rates is 1st May. It is fitting that the venue for this conference is the Alice Perry Engineering Building – Alice Perry was the first woman in Europe to receive an Engineering Degree. Also, for a STEM-focussed event, we have a surprisingly good gender balance amongst our plenary speakers!